The real purpose of the Donald’s missile-rattling is nothing more than helping Bibi Netanyahu keep his coalition of right wing religious and settler parties together — just what the Deep State wants! At his so-called Cabinet meeting this morning, the Donald basically threatened Iran with annihilation if it does what 15 other signatories to the nuclear non-proliferation treaty (NPT) do every day: Namely, increase production of industrial grade nuclear fuel (3.5%-5.0% purity) at its enrichment plant at Natanz—which, in any event, is crawling with IAEA inspectors. Moreover, it really doesn’t matter whether Trump was play-acting in the style of Art of the Deal or that the JPAOC could be improved. The mere threat of a military attack from the White House is madness because it arises from blatant lies that have absolutely nothing to do with US national security. Nor, for that matter, the security of any other country in the region, including Saudi Arabia and Israel. The real purpose of the Donald’s missile-rattling is nothing more than helping Bibi Netanyahu keep his coalition of right wing religious and settler parties (Likud, United Torah Judaism, Shas, Kulanu and the Jewish Home) together, thereby maintaining his slim 61-vote majority in the 120-seat Knesset. 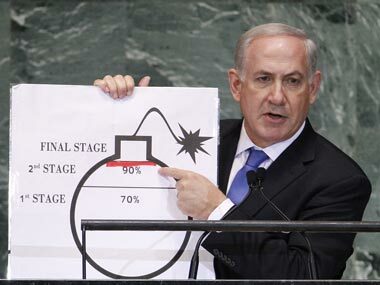 Netanyahu’s malefic political glue is the utterly false claim that Iran is an “existential threat” to Israel because it is hell-bent on getting the bomb. But that’s where the whopper comes in. It amounts to the ridiculous postulate that Iran is so fiendishly evil that if it is involved in the nuclear fuel cycle in any way, shape or form—presumably even just operating a uranium mine—-it is only a matter of months before it will have a bomb. As a matter of record, of course, Netanyahu has been saying this since the early 1990s and he has always been wrong because there were never any facts or logic to support his blatant fear-mongering. For example, here is the cartoon-style, evidence-free “proof” that he offered way back in 2012. The truth is more nearly the opposite. Not only the IAEA, but also the CIA and its 16 fellow spook agencies, agree that Iran has not had anything which remotely resembles a nuclear bomb weaponization program for the last 15 years; and that even the one it ran briefly in 1999-2003—out of fear that Tehran’s mortal enemy, Saddam Hussein, might be doing the same–was essentially a series of science experiments that didn’t get close to making even a single bomb. The fact is, 98% of the enriched uranium that Iran had on hand at the time of the 2015 nuke deal was in the LEU (low enriched uranium) category and was not remotely relevant to a bomb. And the 2%balance (450 pounds) was enriched to the 20% medical isotope level (also non-bomb grade), which, according to IAEA verification, has all been shipped out of the country. Iran never had, nor does it possess now, anything close to the 90% enriched weapons grade (HEU) material that is an absolute pre-requisite for a nuclear bomb via the U-235 route. Moreover, it couldn’t possibly go the plutonium route to a bomb, either. Pursuant to the deal, its plutonium reactor core at Arak—which theoretically could have produced enough plutonium for two bombs per year— has been completely removed and filled with concrete. Even the tin foil brigade among the neocons can’t plausibly suggest otherwise because the whole process has been viewed and verified by the IAEA inspectors. In sum, if the Donald succeeds in killing the JPAOC, Tehran would have every right under the 193-nation NPT (which it signed but Israel, North Korea, Pakistan and India didn’t) to go back to making more industrial grade reactor fuel for civilian power. Back in the day, the great Dwight D. Eisenhower called the latter Atoms for Peace. But after yesterday’s blatantly stupid action, the Donald has in effect declared himself to be the middle east’s Spanker-in-Chief, promising to annihilate Iran for doing exactly what Ike had in mind. Next Post Who’s Most Afraid of a Latin American Debt Crisis (Apart from Latin America)?